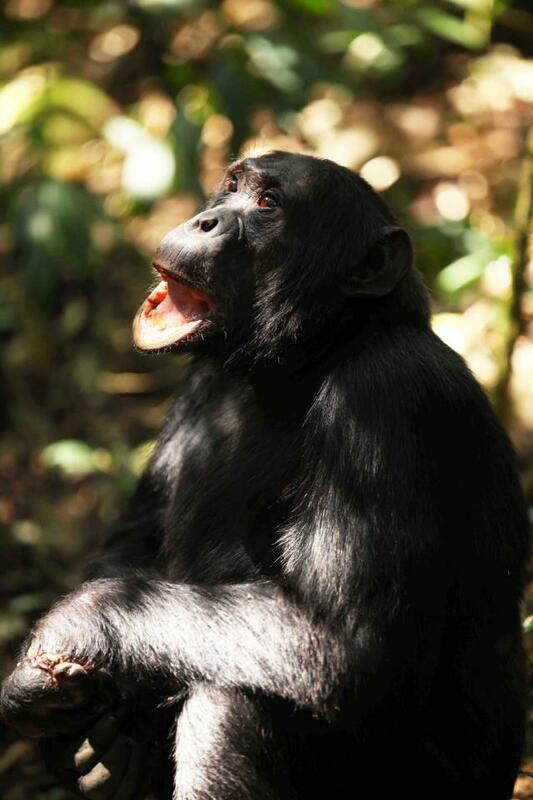 Garrett is one of the many Ngogo chimpanzees with a snare injury. He stepped in a snare made of nylon, a material that does not degrade over time, over a decade ago and the snare is still wrapped around his hand. Kibale National Park contains the largest population of chimpanzees in Uganda and one of the largest in East Africa, making it one of the few remaining strongholds for chimpanzees in the wild. The main threat to chimpanzees in Kibale is poaching, which has increased in frequency alongside increases in local human populations. Although there are local taboos against eating chimpanzees, they get caught in the snares set by poachers to catch other wildlife so often that it is estimated that fully one-third of the chimpanzees within the park have snare-related injuries. Those chimpanzees who are able to free themselves usually cannot remove the snares entirely, and over time, the wire or nylon material becomes wrapped tighter and tighter around their fingers, hands, or feet, causing pain and infection, and often leading to the loss of the snared body parts entirely or even death. In an effort to protect chimpanzees and other animals in Kibale National Park from illegal hunting, the Ngogo Chimpanzee Project employs two teams of local people, who patrol the park for snares and signs of poaching activity. 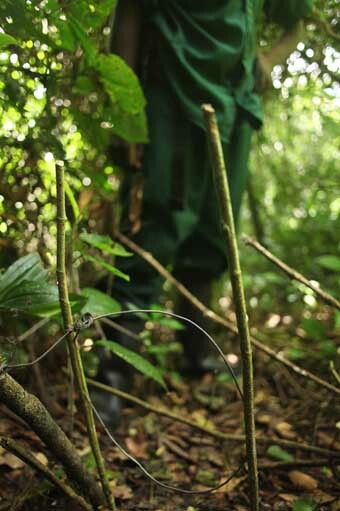 We work closely with local Uganda Wildlife Authority law enforcement officers, to whom we turn in confiscated snares and GPS coordinates when we encounter signs of poaching activity. Our snare removal teams currently patrol over a large area around the Ngogo territory but we are hoping to hire a third team who would be based in a southern part of the park known to be under heavy poaching pressure. This program would not be possible without the generous support of the North Carolina Zoo, the Detroit Zoological Society, the Disney Wildlife Conservation Fund and numerous private donors. Please consider making a tax exempt donation through our secure Paypal links on the left side of this page to help us continue funding this important program. If you access Amazon through any of the links below, Amazon will donate 4-6% of the purchase price to the NCP. NOTE: if these links do not appear, try disabling your Adblocker and check again. © 2019 The Ngogo Chimpanzee Project Inc.